If you've come to a complete stop and it's hard to shift into 1st or R (Reverse), leave the shift lever at neutral position and release the clutch. Depress the clutch pedal back down, and then shift into 1st or R (Reverse) gear position. Do not drive with your foot resting on the clutch pedal or use the clutch pedal to hold the vehicle stopped on an uphill or at a traffic light. This will result in premature clutch wear. When you must slow down in heavy traffic or while driving up steep hills, downshift before the engine starts to labor. 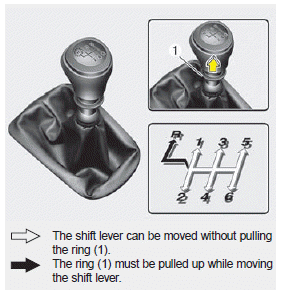 Downshifting reduces the chance of stalling and gives better acceleration when you need to increase your speed again. When the vehicle is traveling down steep hills, downshifting helps maintain safe speed and prolongs brake life.